Tungsten carbide tips have thin metal blades or disks with sharp and toothed edges. Tungsten carbide is widely used for making tool for cutting wood, metal or other hard material. With high hardness, wear resistance and heat resistance, TC is suitable for making blades, cutters and tips. Our tungsten carbide blades are made from fine tungsten carbide and are suitable for processing cast iron, non-ferrous alloys, non-metal materials, and so on. We mainly provide four types of tungsten carbide tips including tungsten carbide brazed tip, tungsten carbide cutting blade, tungsten carbide milling blade and tungsten carbide disc cutter. Tungsten carbide blades are basically for cutting hard materials, such as hardened steel, stainless steel, cast iron, non-ferrous metals, fired ceramics, plastics, hardwoods and others. It is also used for finish machining of glass, shaping, smoothing and material removal. 1. Our tungsten carbide blades are precisely manufactured to the highest standards for accuracy and durability. 2. We are able to make products in both standard and custom configurations. 3. Plenty of products are available in stock. For those we do not have, we are able to produce them within a short time. 4. Samples and quotations of tungsten carbide tips are available and fast delivery is promised. 5. Our company is certified by ISO 9001:2008, and all our tungsten carbide blades are produced under strict quality control. It is characterized by tensile strength, abrasion resistance and excellent performance. 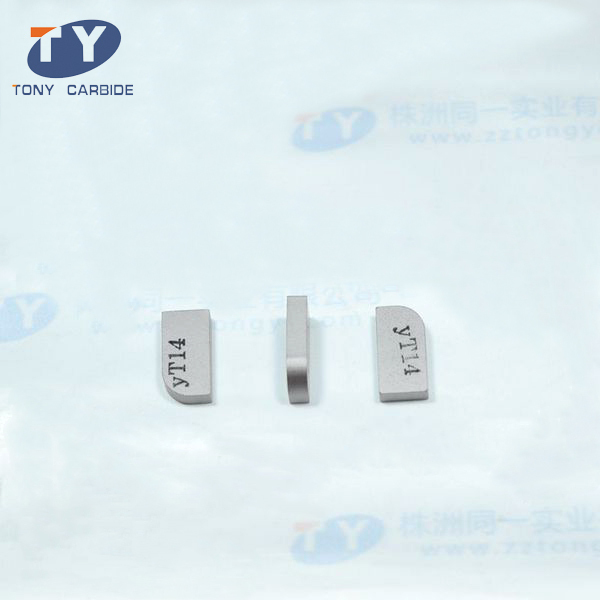 This tungsten carbide tip is widely used in rolling mills and alloy industries. It is suitable for the finishing and semi-finishing of cast iron and non-ferrous metals, and rough machining of light alloys. This welding tungsten carbide blade can also be used for the milling of manganese steel, quenched steel and low alloy steel. This tungsten carbide tip is basically categorized into carbide inserts with holes and carbide inserts without holes. The code name of the ones with holes consists of form, basic parameter and flute profile, while the code name of carbide inserts without holes comprises of form and basic parameter. This tungsten carbide blade is able to deal with hard metals such as stainless steel and titanium alloys. It features high hardness and good cutting force and it can improve rotating speed and feeding rate. This type of tungsten carbide tip uses abrasive powders and high speed vibratory motion to cut discs, holes, cylinders, squares and other shapes of hard or brittle materials. It is mainly used for cutting and machining wooden and steel products. Established in 2002, Zhuzhou Tongyi Industry Co., Ltd. has rapidly grown into one of the most prominent manufacturer of tungsten carbide blades in China. Our typical products include carbide drill bits, carbide brazed tips, carbide milling cutters, carbide rods, carbide disc cutters, carbide drawing dies, carbide anvils, carbide blanks and so on. Over the years, our tungsten carbide tips have been exported to Vietnam, Indonesia, Canada, Russia, Poland, Ukraine, etc. We are able to produce custom carbide products according to customers’ requirements.